Some of my favourites here too - especially those lips!! And still some more that didn't make it here that I remember and *loved*. You are an awesome designer!! You definitely rock the pink...love all of these beautiful choices. wonderful choices Joan - love the top left and center right the mostest!! look forward to some more creativity in 2017 - and hope it is a fantastic year for you! I love all of these, Joan! Happy New Year! They are all beautiful! Happy 2017 to you and your family! Awesome collection of favorites! Thank you, Joan, for sharing your talent, enthusiasm, and humor with us in cyber-space. You make the world a better place! You made a lot more than nine cards in 2016 that I didn't hate, but these are certainly some favorites that I remember. It's funny how we have a love/hate relationship with our own work. If we could block out all other influences we might be less confused and feel differently. I'll be watching your trends in 2017 and enjoying every moment of it. Wishing you a happy new year! 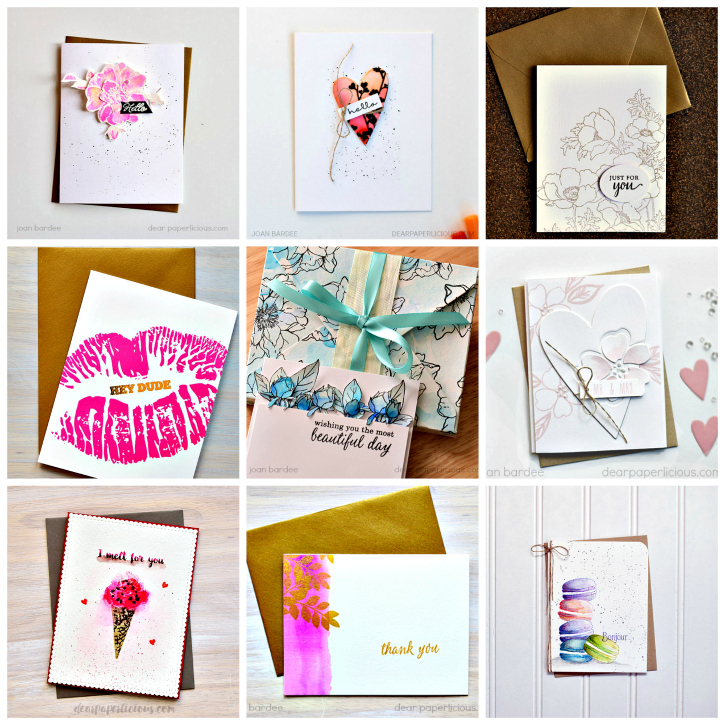 So many great cards, who could choose just nine out off your blog? Not I! These are great tho!! !